There exist a couple of different loads for usage with usb devices, this one is adjustable, can handle a lot of power and can control different fast charge schemes. On the topside is a nearly noiseless fan and a multiturn trimpot to adjust the current with. This side has a lot of electronic on it. The load is a IRF3710 mosfet transistor, controlled from a MCP6002 dual OpAmp. The trimpot has a TL431 reference across it. There is also two voltage regulators, one for the fan and one for the electronic. 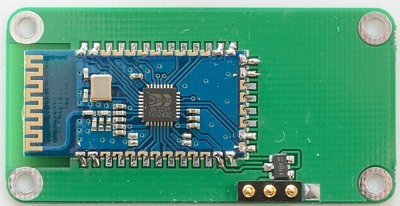 The “big” chip is a ATtiny24A microprocessor that controls the fast charge modes and keep an eye on maximum power level. 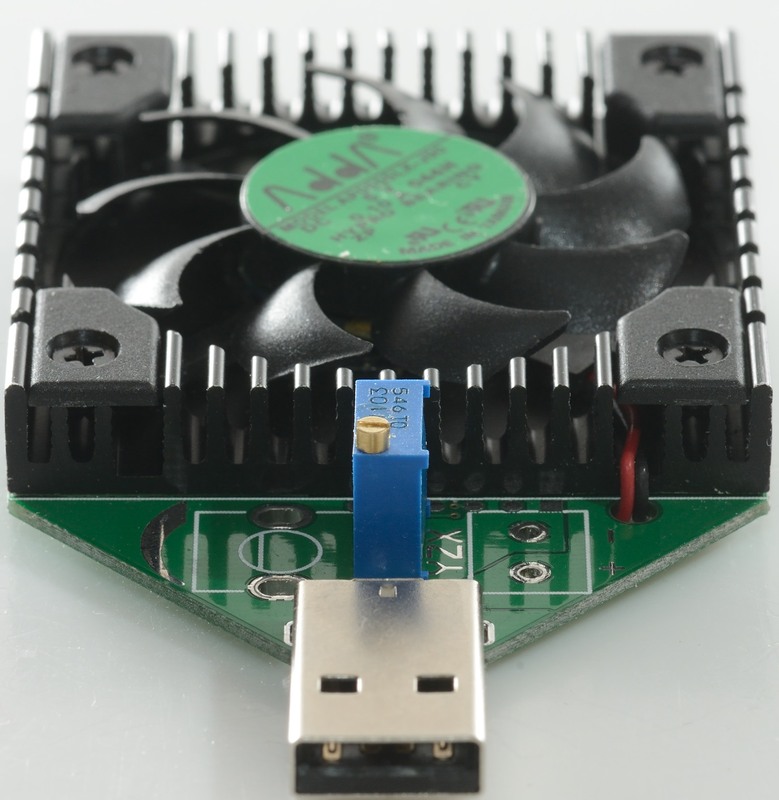 If you look closely on the board above, you will also find a small multicolored led, it has 3 leds inside. 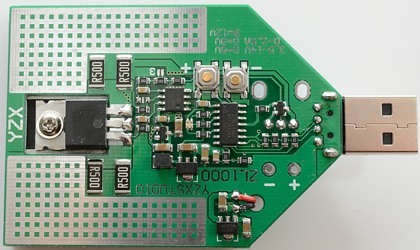 This led is used to signal different modes. 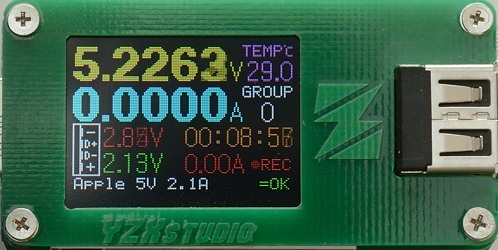 Here it is together with a usb monitor that can show voltage, current, capacity and also usb coding. I used the limit from the circuit board (i.e. 14 volt). At the currents the load is stable with any voltage, when the current increases the power is limited and there is some variation in the current. 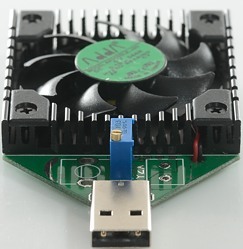 Here is a close look at the minimum current, it depend on the voltage (May be due to the fan) and it is not completely stable. I put a current clamp around the wires and connected the scope. The current was above 3A sometimes. The circuit is oscillating. Testing a bit more at different current and voltage levels shows that the circuit is very sensitive, sometimes it will oscillate, sometimes not. The difference can be a hand around the wires. I did try this with 3 different power supplies, with all of them there were oscillations. 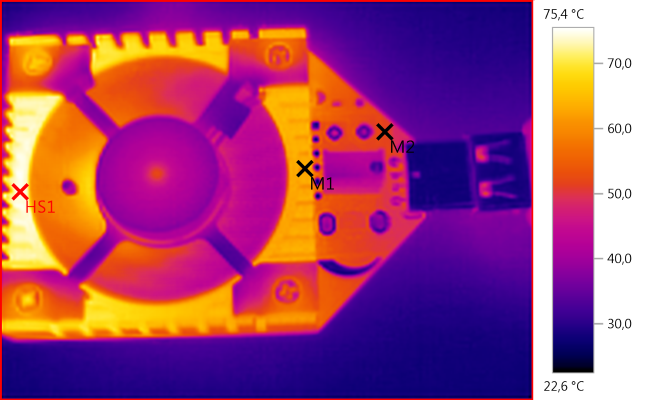 This IR photo is after 25 minutes with 12.5 watt load. 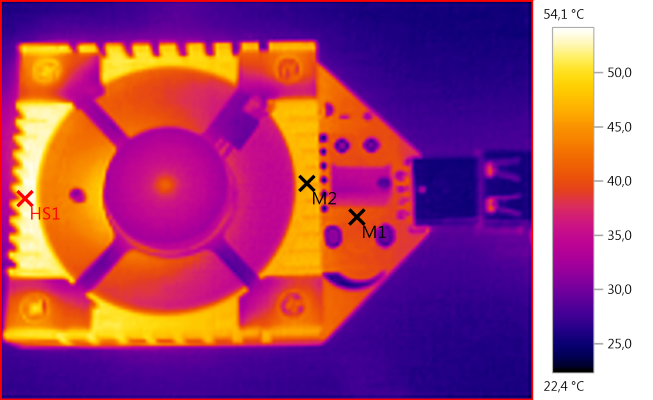 This IR photo is after 25 minutes with 22 watt load. Everything is getting hot, this is the reason for the current change. 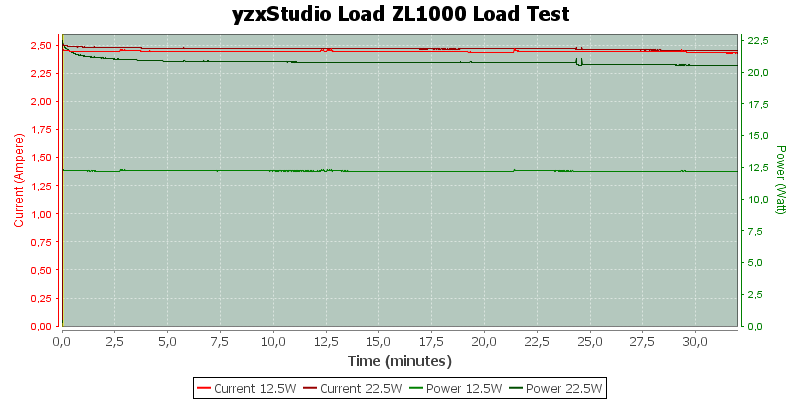 Let’s take a look at how stable the load is, for this I have zoomed the current and power scales. I have about 0.1A drop in current, this is about 4%. 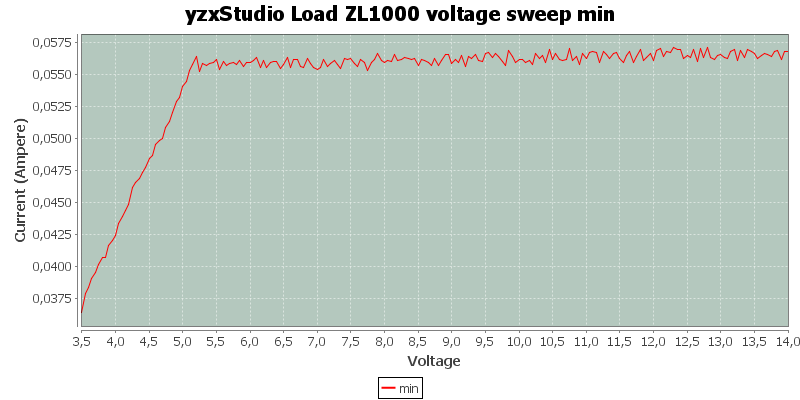 The two spikes on the curves are because I touched the wires and affected the oscillations. Using the two buttons on the circuit board it is possible to activate smart charge modes. It can select a specific QuickCharge voltage or cycle between them either fast or slow. Above I have selected a fast cycle. When the load is put into a QuickCharge charger the led will turn on and if one of the QC modes has been selected on the load it will switch the charger to that mode. It do not support the 20V QC mode. 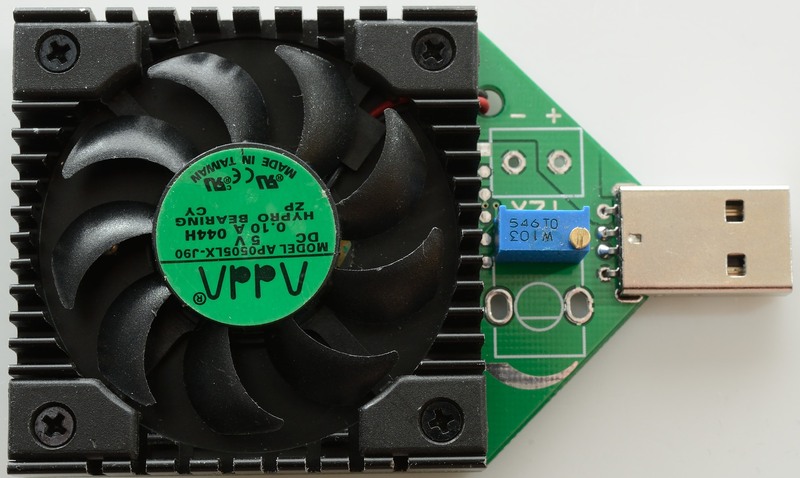 Selecting QuickCharge 3 mode it is possible to step the voltage up/down from a QC3 power supply. I pressed the +/- buttons a lot for this chart. In MTKPE mode it can send up/down requests to the charger. For testing usb chargers and power banks this load is very interesting, it can handle the power and it can select fast charge modes. The instability in the circuit can in some cases give misleading results. I am not very happy with the trimpot or the small buttons on the back. I would have like the buttons at the edge of the circuit board, one on each side, this would have been much easier to use without looking at them (Display is on the other side when connected to a monitor). The trimpot requires a tool to adjust. It is also a good idea to do all adjustments before starting a test, it gets rather hot! Even with the above issues I will call it a fairly good load and with way more functions than any other load on the market. 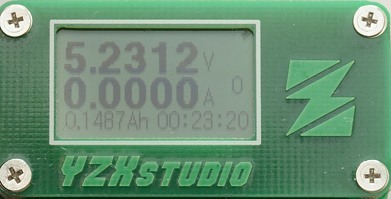 YZXStudio makes a series of usb meters with nearly identical specifications, there is also frequent software update with significant improvements. It is possible to install update, but it requires special tools and access to the updated software (The above shop sells the tool and gives access to the updates). 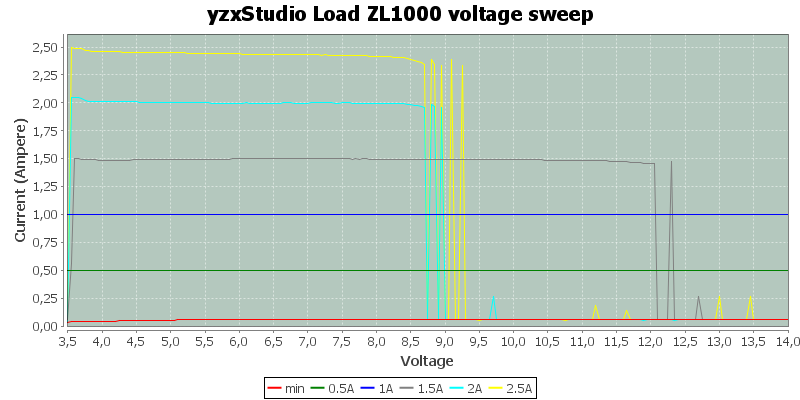 This table compares some of the YZXStudio usb meters. Notice the small button, it is used for all the functions. There is also a micro usb input connector. Welcome screen, it is shown when power is applied (it can be disabled). 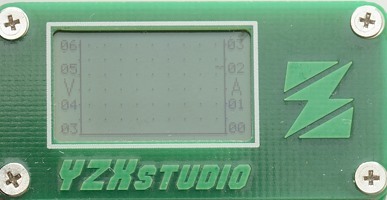 The first screen, it shows V, A, Ah and time, the “0” is selected memory bank. Next screen shows Wh and W, instead of Ah and time. This screen shows usb coding and voltage. From voltage and current the resistance of the load is calculated and shown. 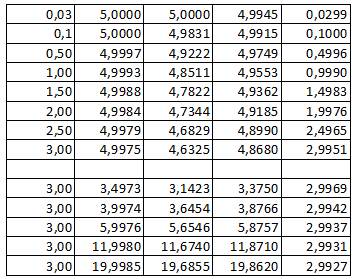 It also shows the trickle current threshold, only current above this value is summed (Value is configurable). 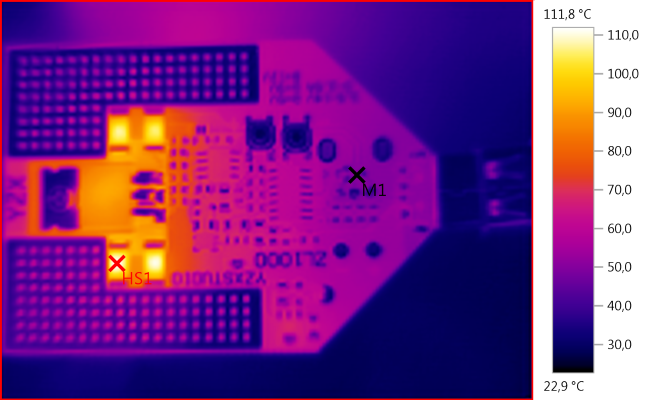 The temperature is the internal MCU temperature. 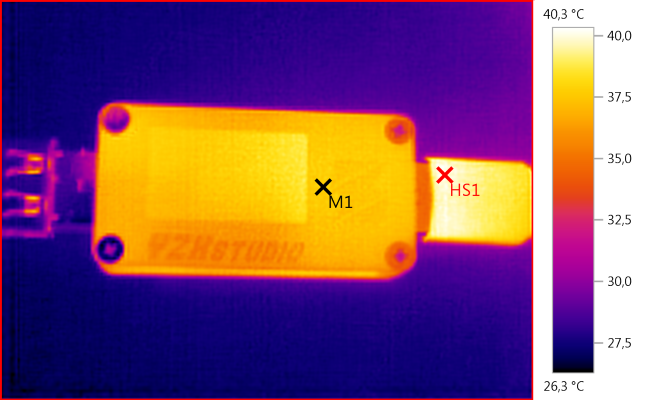 Note: Sometimes the display will show two usb codings, because it cannot determine which one is valid. This screen is used to calculate cable resistance, to use it a constant current load is required. First do a measure without the cable, hold down the button to set the reference. Then add the cable between the usb power source and the usb meter. The display will show the resistance. 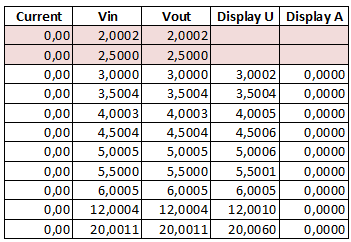 A chart of current and voltage, sample rate can be configured. 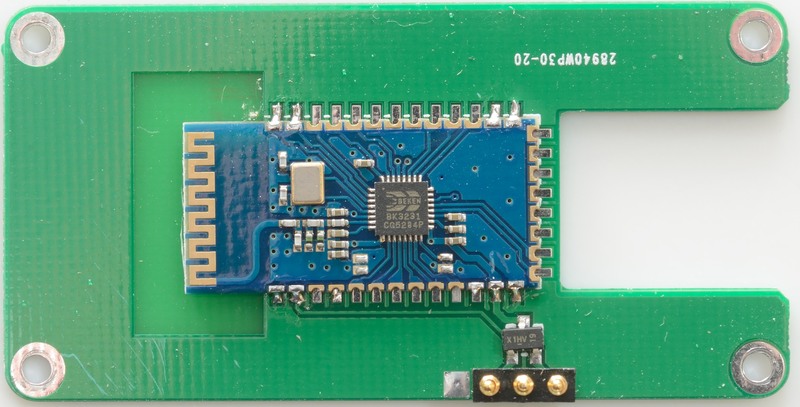 This usb meter can have a build in bluetooth transmitter, this makes it possible to record logfile on a smartphone. Using bluetooth will disable the backlight, this makes the display a bit difficult to read. I would have prefered more values in the log, most important time, but also Ah, W and Wh would be nice. These usb meters are very easy to open, there is only 8 screws to remove. 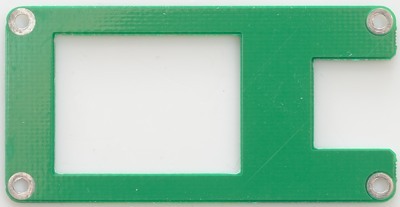 LCD display with a led in the frame. 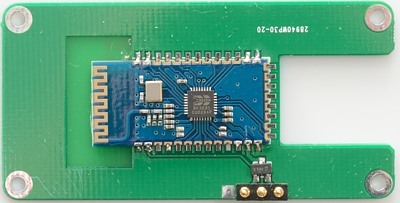 The bluetooth module. This adapter can be bought with or without it mounted. There is also some very small pogo pins. I am guessing a bit with these chips: SE8533 is a 3.3 volt regulator, CBAY is a 18 bit ADC with build in amplifier, FM24CL is the FRAM memory. DALE R012F is the series resistor that is used to measure current over. The microprocessor is hidden beneath the flex cable. The voltage display is very precise with no current flowing (Both voltage and current can be calibrated by the user, I have not changed the calibration, but the dealer may have). 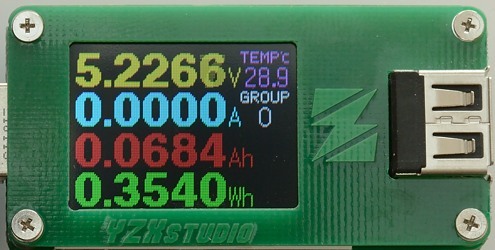 The current display is very precise and will not change with voltage. 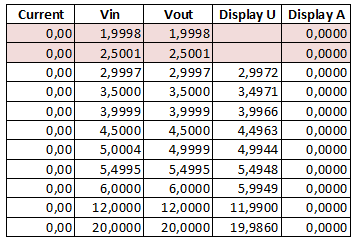 The voltage readout is within 0.005 volt when unloaded. When loaded the voltage will be closest to the usb input voltage. 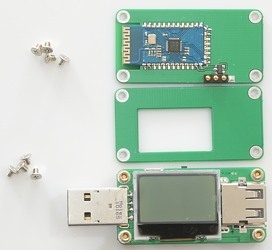 The usb meter uses about 11.2mA current with backlight on, 6.3mA with backlight low and 16.5 with bluetooth connected. 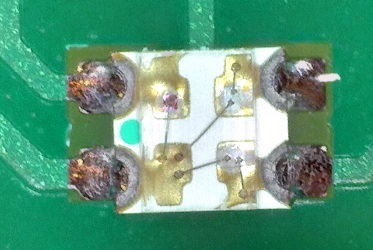 The internal resistance is about 0.095ohm (This includes both connectors). I have played a bit with the cable resistance function, it uses ohms law and is as precise as possible. How precise that is depends on how stable the voltage is, how stable the current is and how stable the connection resistance is. 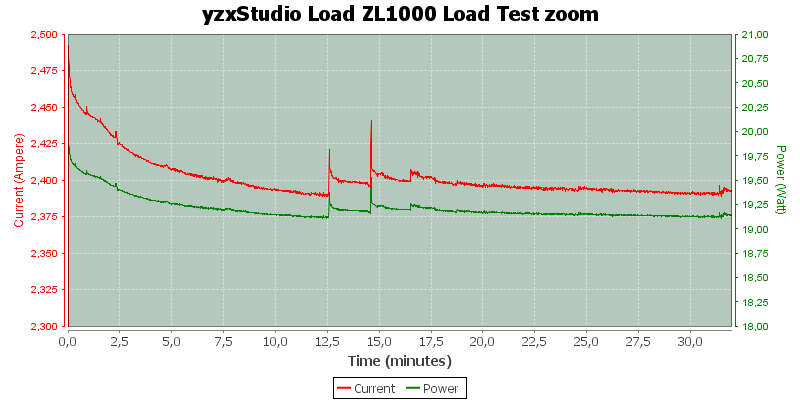 With my lap grade equipment I can get within a few mOhm (1/1000 ohm), for that test I did not even change usb connection (That alone can be 30mOhm). With more normal equipment I would not expect better than 30-100mOhm. 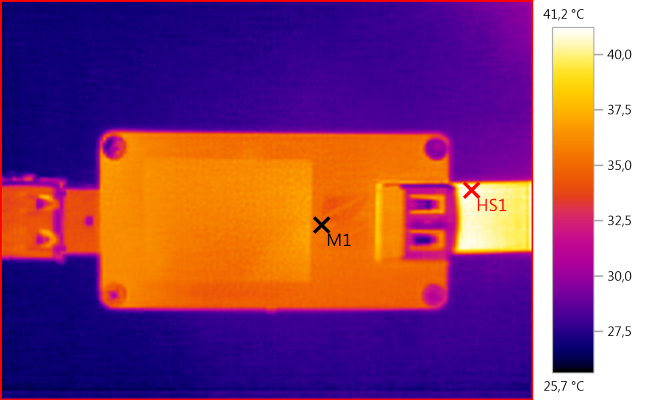 Even with that tolerance it is very useful to get rid of bad (High resistance) usb cables. This is a very precise usb meter with many interesting functions. 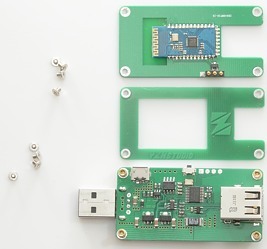 With both good precision and external logging in can be used for testing usb equipment. For these USB meters I used very precise equipment (Keithley: DMM7510, 2280S, 2460). I got it from ebay dealer dz-stuido. 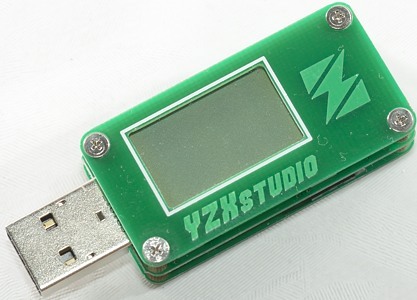 YZXStudio makes a series of usb meters with nearly identical specifications, there is also frequent software update with significant improvements. It is possible to install update, but it requires special tools and access to the updated software. 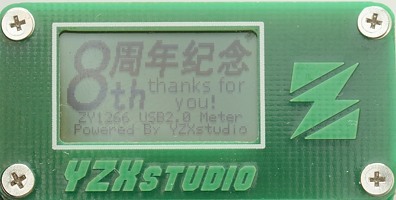 I got it in a small metal box with a Chinese (I assume) manual, because the user interface is basically the same as all other YZXStudio meters I did not have any problems using it. 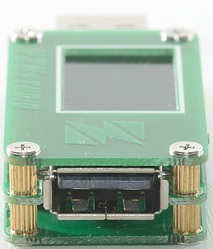 The top usb connector has local auto coding, i.e. when using this the power coding on the power supply is ignored. 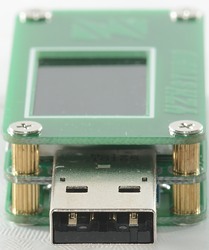 The bottom usb connector has data connection from the input connector, any usb voltage shown on the display is for this connector and the usb input connectors. 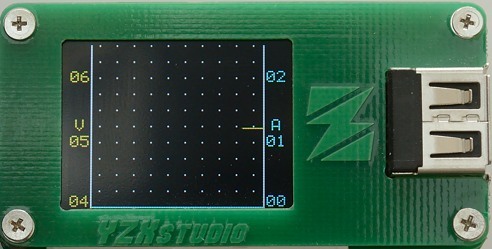 The first screen, it shows V, A, Ah and Wh, the “0” is selected memory bank. It do also have space for the MCU temperature. 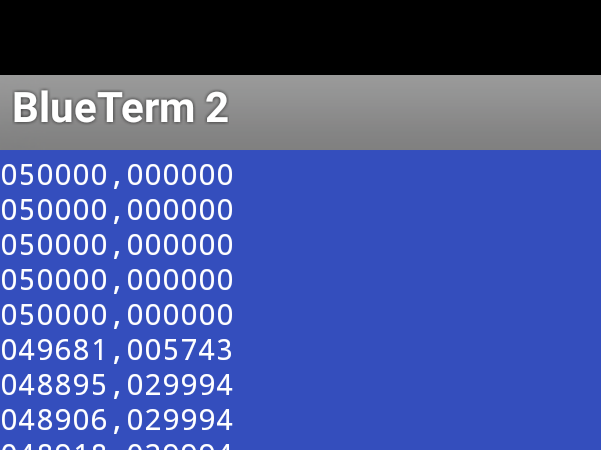 Next screen shows W and ohm, instead of Ah and Wh. This screen shows usb coding and voltage. The time has been moved to this screen. 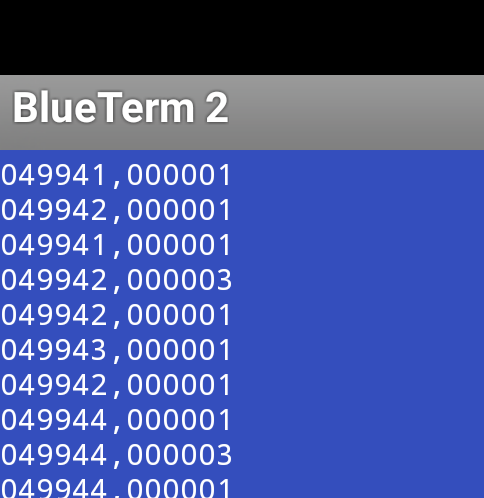 It also shows the trickle current threshold, only current above this value is summed (Value is configurable). 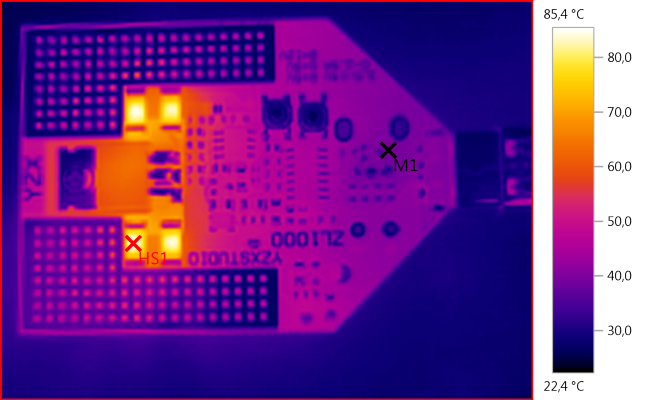 The temperature is the internal MCU temperature. In the configuration it is possible to select between a couple of predefined color palettes. 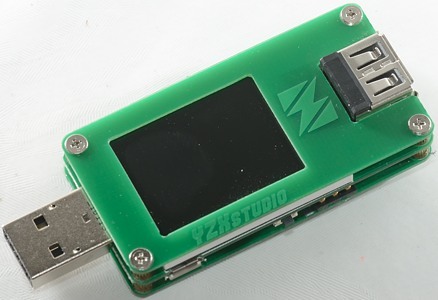 This usb meter can have a build in bluetooth transmitter, this makes it possible to record logfile on a smartphone. 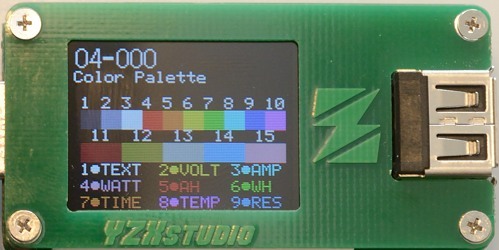 The TFT display with a frame that contains the background light. 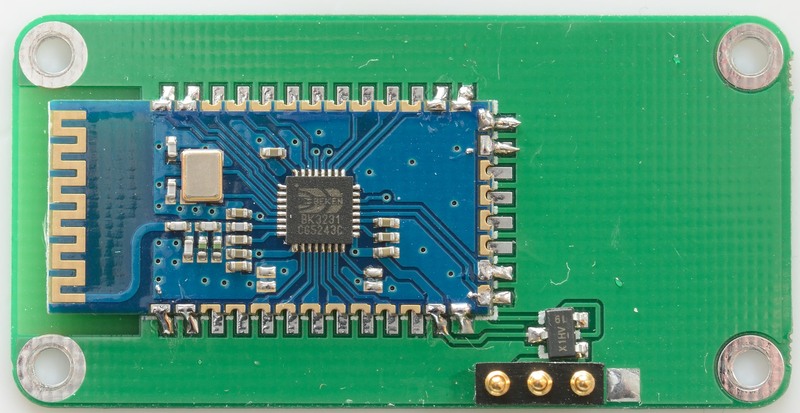 I am guessing a bit with these chips: SE8533 is a 3.3 volt regulator, SE8550 is a 5 volt regulator, CBKW is a 18 bit ADC with build in amplifier, FM24CL is the FRAM memory. DALE R012F is the series resistor that is used to measure current over. 32F030F4P6 is the microprocessor. 2635 could be a usb auto coding chip. 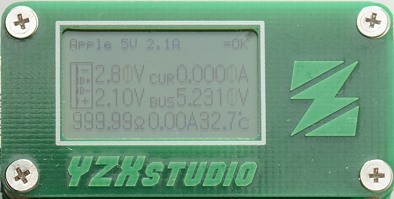 The voltage display is fairly precise with no current flowing (Both voltage and current can be calibrated by the user, I have not changed the calibration). 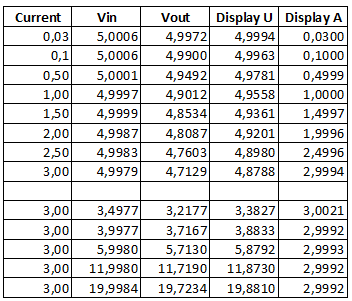 The current display is also fairly precise and will not change with voltage. 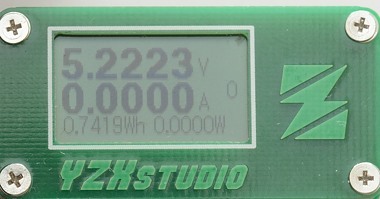 The voltage readout is within 0.014 volt when unloaded. 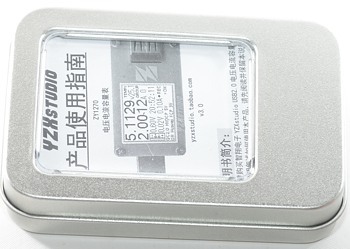 The usb meter uses about 12.2mA current with normal brightness, 8.5 when dim and 21 with bluetooth connected. The internal resistance is about 0.12ohm (This includes both connectors). Bottom usb output is connected to input usb connectors. The larger and always on display (even with bluetooth enabled) makes it easier to read. 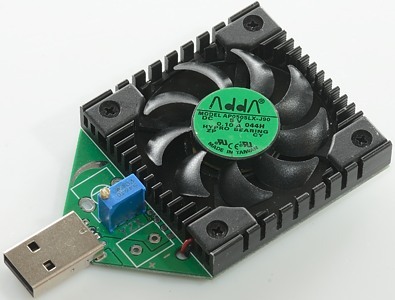 The auto coding output can be used as a quick fix when power supply and device do not match, but getting another power supply is a much better solution. For these USB meters I used precise equipment (Keithley: DMM7510, 2280S, 2460).